Hong Kee Mua Chee & Peanut Gruel | Ipoh Mali Talak Sombong! 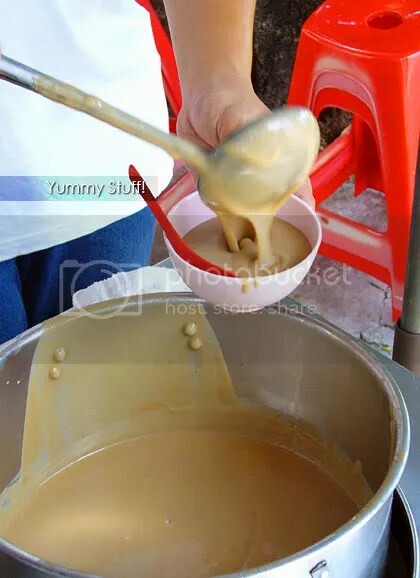 At RM2.00 per bowl (used to be RM1.50) and served warm, the peanut gruel was smooth, creamy, fragrant and has the right balance of sweetness to it. 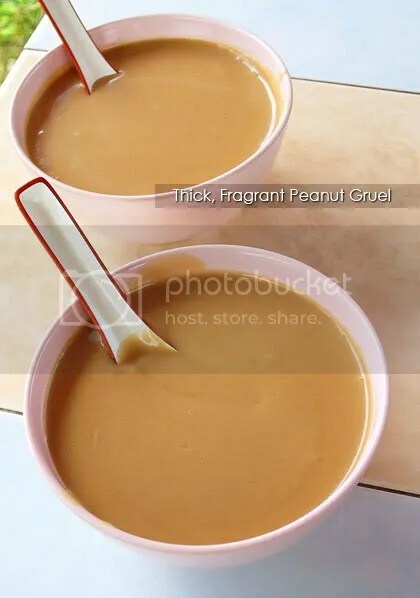 As I’m a big fan of peanut, I used to like peanut gruel a lot when I was younger but then, I found those sold elsewhere were either diluted or has the rancid smell to it, hence my interest in peanut gruel diminished gradually. Hong Kee’s version definitely is the better one I’ve tasted so far. And since we’re here, we couldn’t just leave without trying the mua chee (glutinuous rice flour cake with peanut, RM2). 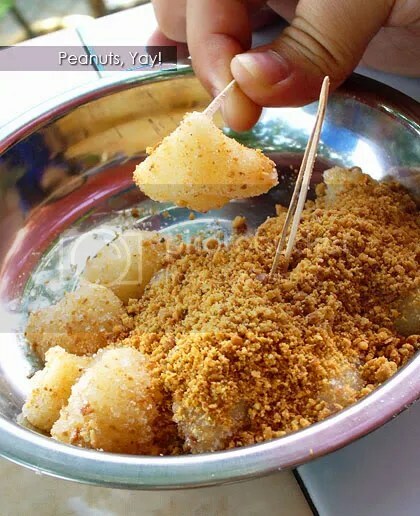 While most proprietors cut up the dough with metal spatula, Hong Kee pinch the balls of dough from a damp-cloth covered pot and toss them individually in the grounded peanut and fine sugar mixture. You could feel the crunch of the grounded peanut and sugar once you popped them in your mouth, and again, the sweetness was just right while the grounded peanut were really crunchy – freshly grounded peanuts, that’s it! 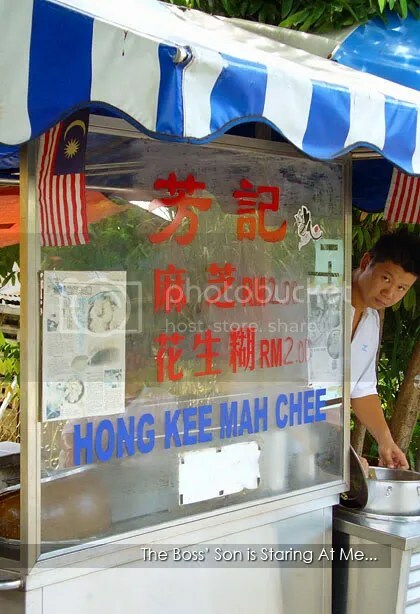 This entry was posted in Food (Ipoh), Gathering, Type: Dessert, Type: Hawker Fare by Jason. Bookmark the permalink. Wowzer! RM2 is still a cheap price to pay for that thick gooey yummilicious liquid, considering how expensive peanuts are these days. Mmmmm. Love mua chee but so hard to find a good one. Have tried too many where its packed with too much sugar so in the end, it’s just SWEEEEEET with a hint of peanut. can tar pau some for me???!!!! Must try the peanut gruel. Looks thick, must be good! Yes yes… or the peanut not fragrant enough. Hehehe, then you come over to take it? Yes, go try it when you’re back! 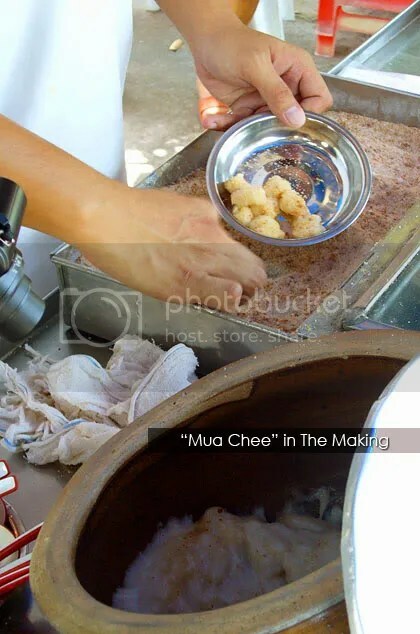 The Mua Chee’s good, but somehow … the idea of someone pinching your food with bare hands, right before you bite into them …. ahem. Then we should skip roti canai! To know the truth, you have to go there lor. How long has it been since you last stepped into Ipoh ah? Can can, let’s meet up someday! Aah,my saliva drooling already just from these photos. Will definately give it a try next time when I am going back to Ipoh. Your blog is added to my list. 🙂 Nice blog with an nostalgic air! Actually the words are “ground peanuts”, not “grounded peanut”. Grounded means a different thing from ground.